HID VS LED Headlight Bulbs | Mystery Solved: Which One is Better for You? Cars are something that’s the most common mode of transport these days. Nearly everyone owns it. A lot of people like their cars to be basic and some customize it and hit the road. Of all the beautification, one thing that really stands out is your headlights. Car lovers already know what I mean. Commonly, there are three kinds of headlines in the market- Halogen, LED and HID or Xenon lights. While Halogen is currently being used commonly, but the wonderment in the market has been taken over the LEDs and Xenon lights in the recent past. No matter the company, from Audi, Mercedes to Suzuki, the cars comes with an installation of either LED or Xenon lights. Due to a striking difference in the price range, some people prefer to use it as an add-on. The hype these lights are getting is increasing day by day due to a lot of reasons. The foremost being that they are brighter as compared to the halogen lights, they are also reliable on the basis of their efficiency and durability. Another thing which tempts you to buy them is the reach which they offer in terms of sight and yes, not forgetting the fashion either. In this article, we shall briefly discuss LED headlights and Xenon lights which will help you decide on what to settle for. 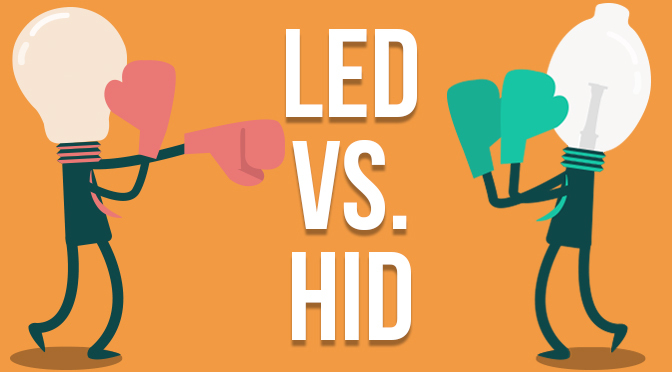 LEDs or Light Emitting Diodes are much lighter and brighter as compared to Halogen lights. While halogen lights use a filament to produce lights, LEDs, on the contrary, excites electrons via a semiconductor. This means that LED headlights are shock resistant. This entire process has the next level too if you want to jazz up your car a bit in lower costs. The trick here is if you try to adjust the material properties of the semiconductor used in LEDs, you can change the light frequency hereby changing its color! Why LED Headlights for your car? LED lights are light in weight and can be installed easily. The lights have 100+ watts efficiency though they tend to get dim down the lane with constant use. It has a much longer lifespan as compared to Halogen and HID bulbs. Also, it does not glare too bright like HID headlights and flicker as Halogen lights. LED headlights are expensive than its counterparts but has almost zero maintenance. Speaking of warranty, they usually work seamlessly fine and come with a rough warranty of about 5 years. Also, no need to worry about the climate as it turns on the moment you switch the engine on. What are HID/ XENON Headlights? HID or High Intensity Discharge lights contain xenon gas for its functioning. The lights emitted from the arc which form between two tungsten electrodes installed in the bulb. This produces a much brighter and glaring effect as compared to LED and Halogen headlights. You can commonly spot these lights in public places in lamps, fountains etc. These lights entered the fashionistas’ world in the late 90s when their experimentation in the cars led to giving them a classy yet a cool look which was never experienced before. (As these lights are much brighter than LED). However, they consume a lot of power when the engine starts but tends to use less after some time. Why HID/Xenon Headlights for your car? HID lights are the brightest and provide much more coverage insight as compared to LED and Halogen headlights. Also, they are efficient upto 100 + watts but fragile in nature. Even though they have a glary nature, they require a good 5 minute warm up to start and do its work. Sometimes, the glare is strong enough to cause a problem for others as it nearly blinds the vehicles traveling from the opposite direction. They also cannot be functioned to dim even after a long usage and possess maintenance needs which need to be taken care off. As far as warranty is concerned, they came with a 2 years maximum warranty period and require a regular replacement of the ballast. Both – LED as well as HID lights comes with their own set of pros and cons; ultimately it also depends on your usage and needs.